I also really need to do this to keep me on the straight and narrow as far as my blogging adventure is concerned. I am a full time teacher in a secondary school and believe me it takes up a lot of time to do it well. To me teaching is the most rewarding action you can undertake in life, but whether you are a parent trying to teach your child to be healthy and wise, or a historian trying to develop interpretations of the past that will inform the present, it’s flipping hard work! It is seriously hard work. I am, in some ways, making myself accountable to you dear readers. 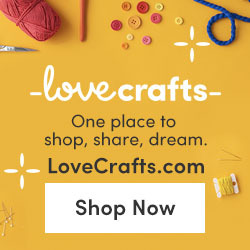 I am making a commitment to you that I will keep you informed of my progress and will, along the way, show you how you too, can make money from your crafting hobby. So ad income is still a bit of a disaster zone! Here’s why. In February I just didn’t have much traffic coming to my site. I struggled to get enough posts out, though I did manage these: New Crochet Blanket Pattern for You and January Income Report and I was pretty clueless about how to encourage more people to come and have a look at what I was doing. Short of running down the street screaming, “Look at my website!”, I got a bit stuck. Until… (dramatic pause) I discovered Pinterest. Right at the end of February I learnt from a few other bloggers’ websites that Pinterest had transformed their page views, so I gave it a try and managed to go from an average of 250 views per month, all the way to over 1K and that was just from pinning in one week. I can’t wait to share my March progress with you because I’ve really got into the swing of it and things have progressed even more, but shhhhh, that’s a secret until next month! I have everything crossed that this will improve my ad income. I am now signed up to Amazon Associates, Affiliate Window and the Loveknitting.com affiliate programme. I then did naff all about adding links to my pages and posts! Must try harder… Honestly, you have no idea what a novice I am at all of this, so just signing up was an achievement! This is a tricky one. So I did manage to wind a load of yarn cakes and bought a fabulous basket to arrange and photograph them in, but I only managed to get one collection listed and sold before the month’s end. This has recently improved, so I can’t wait to share my March results with you soon. I really shouldn’t wish the rest of the month away though as there is still so much to do! Considering this was just scraps and leftover yarn that was otherwise going to waste and taking up room in my home, I’m actually very pleased with this sale. Don’t forget to sign up so you can join me for my fabulous March updates – I can’t wait to share them with you!